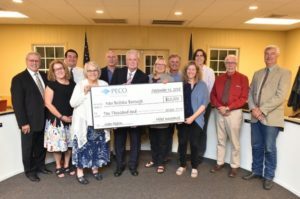 New Britain Borough is pleased to announce the award of a $10,000 grant through PECO’s Green Region Program! The grant will be used on the two service islands along Butler Avenue between the Town Center shops and Tamenend Avenue. The borough will replace the diseased ash trees on both islands with new foliage, as well as add new benches close to the sidewalks. Special shoutout to volunteer Tess LaMontagne for her significant contributions to this grant application.